Being the only female in the house, I am The Minority. I’m the sole representative of All Things Female. Since I’m one of four people, I guess that makes me the twenty-five percenter. I AM THE 25%! Being female is not the only category for which I am The Minority. “The 75%” have been pushing through a new agenda asserting their majority status and have bonded in the effort to convince me to join the ranks. Now, I’m a pretty easy-going mom and wife but I’m not sure I’m on board with this one. My boys want a dog. In years past when talk of pets arose amongst the troops, I either flat-out nixed it or listed the hundreds of reasons why it was a bad idea: We live in a townhouse. Since we’re all out of diapers, do we really want to introduce another waste management issue into our lives? What about the furniture? The shedding? The costs of vet care? Walking? Walking in the snow? Walking in the heat? As pet owners know, having a pet is a huge responsibility. The kids are too young to take on the task, so the work will be up to me and my husband. In my head, having a dog is like having another baby– except you can drag a baby with you wherever you need to go and people are more willing to watch it. Do I really want to take on an added responsibility? I have work and the boys and the house, and special needs issues with M. Remember these Legos? Apparently dogs eat Legos. Just ask Jane Doh! at ravenjanedoh. She posted a comment on my Lego post that her Boston Terrier eats Legos (which actually motivates her kids to clean them up). Also, after seven years (SEVEN YEARS- not a typo) M. is (mostly) sleeping through the night. What if Dog wants to be let out at 5:00 a.m. when I am finally able to sleep? Still, for some reason, when the topic of a dog recently came up again, I considered it. Why the change of heart? you ask. (1) My husband, a teacher, is home during the summer and is willing and able to train. If we get the dog at the start of the summer, he will have significant time at home to do the training before we need to leave it everyday for work. (3) Our townhouse is a decent size (four levels including a finished basement), and although our yard is tiny, it’s fenced in. If there were three feet of snow on the ground, we’d be able to let the dog out back without having to walk her. Which wouldn’t stop me from buying her a cute pink doggie sweater anyway. (4) Our stuff isn’t new anymore. Our living room carpet is a mess and the couches are worn. The boys have been abusing our household for nine years now. As such, neither husband nor I are too concerned with possible puppy mishaps. It all needs to be replaced regardless. (5) After debating whether to seek a breeder or adopt, we’ve decided on adopting. Saving an already-born animal seems like a nice thing to do, and I like to do nice things. Of course, an adopted dog will most likely come to us already named, which will disappoint my husband who has taken to calling our not-yet acquired puppy, “Khaleesi” due to his current geek-fest over Game of Thrones (GOT is another television series based on books (by George R.R. Martin) that my husband loved, like The Walking Dead, but I digress . . . ). 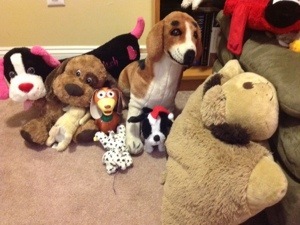 That’s a picture of Valentine Dog, Remy, Slinky, Remy (we have lots of “Remy’s”), Christmas Dog, Pillow, and Lucky– just a small sampling of M.’s collection. How do I deny the kid, especially if a dog can help with his issues? I’ve posted about M.’s autism here, and here. He has a hard time connecting with people outside of the family, but seems interested in animals. Every Sunday he has his therapeutic horseback riding lesson and loves the horses. He enjoys books about animals, television shows about animals, and of course, his dog collection. When he’s playing with his dogs, he talks to them, calls them by name, sits them in circles and kinda sorta “interacts” with them. Not that they interact back. Baby steps, right? Anyway, he seems to relate to the stuffed dogs. Whether or not that will translate to a real dog, I don’t know. 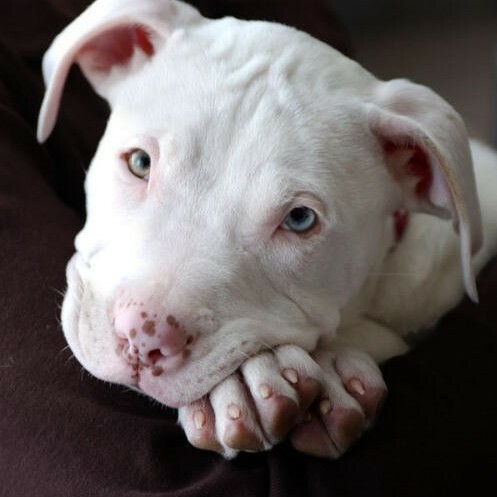 Right now we are in the early stages of researching pet adoption and breeds (we are interested in a well-trained pit bull- don’t believe the hype about them- they actually can be a great family dogs- see pic below). Well, Dog People of Blogtropolis. What do you think? Tell me how much you love your dogs, and that I should let majority rule on this one. Or tell me I’m nuts. HELP me! Because really, although I’m The Minority, I’m extremely powerful in this democracy. I totally have veto power that I’m not afraid to invoke! I don’t get a vote nor do you the opinion of yet another Y chromosome. I can predict things: K will poop and you will step in it. 4 household members will claim her as theirs especially. Division of labor issues will get exacerbated. People will get sniffles and the sky will fall. Ok not all of that. I want a cat (can we Dana?) but with all of the above, it won’t happen. That’s fine, too. What’s my point? I forgot. That will probably all happen. Yeah the poop definitely makes the “con” list! I hope you get a cat. (Please Dana?). I grew up with 2 cats but husband is allergic. I vote you let M find the right dog. He’ll know the right one when he finds it, and the dog will respond accordingly. – Though speaking as someone who has done K9 SAR, and has a niece who will be getting a service dog…. and the sad fact I am constantly volunteering at the humane society … and did I mention the 20-some years working in the Veterinary field? In short, it may take a few visits to a shelter, so be patient. You don’t always find the right fit the first (or second, or eighth) time. I can’t say it will all unfold like a Disney musical, but little in life does. Patience pays in the end. … and a dog is a great motivator when it eats everything on the floor. At first I got mad, but then had an “Aahhaaa!” moment; dog eats toys, kids cry and hide the toys = clean floor. It works for husbands and their shoes too. I like the sort of “reverse psychology” aspects of the dog and the floor. Thanks for your advice. We’re seeing as we look into it more and more that we need to take our time and really be patient. I would love to know how the service dog works out with your niece. I bet she will love him or her. Suffice it to say that if it helps M that is the decider. But remember… Until they graduate from college and beyond you will be walking a dog. Said like a true cat person, right? Maybe I’ll burn some calories in the process. When the kids get big I can probably bribe them to do the walking. Speaking from someone on the spectrum, I find dogs to very therapeutic. I could spend hours with our dog Sophie. But if you get a dog, make sure you get one that’s housebroken and trained. Good plan. Thank you. What breed is Sophie? Some say they are the best dogs in the world 🙂 We are looking at different breeds, particularly ones that don’t need a yard and are happy walking (a.k.a. lazy dogs). I would consider a Lab, they are great with children and so well tempered. We had 2 labs, now just a beagle. In fact we have 20 birds, 5 cats and 2 dogs. It’s a challenge going on trips, so we have to get people to ‘pet sit’ for us. One dog sounds like a good number! That’s a LOT of animals! Birds! I bet they are beautiful. Thanks, Ellie! Yes long hair is out. I heard a lot of nice things about Corgis. I like the idea of M. picking the perfect dog. Oh, get a dog!!!! Adopt one, and it will bring joy to your life. I should say “MORE” joy to your life. I will be so jealous since I’ve been asking my husband for a dog for the past 18 years. Ah man kudos to you for uplifting the Pitbull – the most misunderstood breed ever!